According to new leaked documents obtained by The Verge report that Google Glass will become available to everyone in the US next week. The new “Explorer Program” makes Google’s new wearable computer available for just 24 hours so you have to be quick if you want to get your hands on a pair. The device will also cost the same as it did for people that had the ability to purchase a beta version of the device, starting at $1.500. 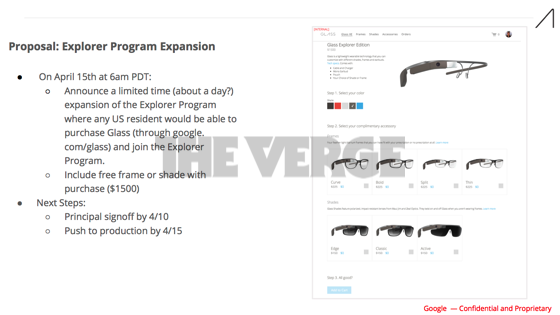 If you decide to make use of the Explorer Program Google will also give you free sunglass shades or prescription glass frames. Currently this information has been obtained from a leaked document, but Google is expected to make the official announcement on April 15th, 2014. Google first made its wearable device available to 2.000 beta testers back in 2012 and this new experiment also seems like a way to get people to beta test the device before its official launch, during Q4 2014.